Archangel Metatron will help you balance internal energies, integrate the whole personality or heal with sacred geometric shapes. Archangel Metatron can be a great ally for writers, especially those seeking to spread, clarify and present spiritual truths. It is a perfect music for meditation. As the king of angels Archangel Metatron links humanity and the Divine. Some say Archangel Metatron is the heavenly scribe, both creator and librarian of the Akashic records. The angel of divine connection and universal harmony, Archangel Metatron is architect of sacred geometry and sits with Shekinah at the top of the Jewish ‘Kabbalah’ tree of life. Together, their purpose is to join the complementary male and female energies, creating a balanced Universe. As we strive to balance our own internal masculine/feminine energies to create our own balanced life so we also help balance the Universe. Creating a balanced life is not easy, choosing this angel suggests that in some way your life is out of balance either because you are not in tune with your spirituality or you are temporarily stuck on your journey searching for love. 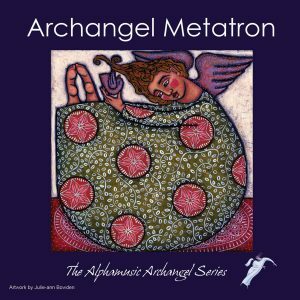 Archangel Metatron will help connect you to the source and you can ask his assistance in attracting your life partner, thus helping you find happiness through true love and creating the bridge to higher self. Archangel Metatron reminds us of the journey through the tree of life back to the divine energy within us all. Archangel Metatron also is said to represent judgement, so we can ask him to help us let go of judging ourselves and others. After being on sleeping pills for eight years, I managed to free myself from them just by listening to your CD. I have a bipolar disorder, which some also call sleep disorder, since it invariably affects the sleep of the patient. I was given the CD as a present and at first was reluctant to believe that it would do me a lot of good, however it transpired that it was a most welcome, great surprise that your CD was so effective.